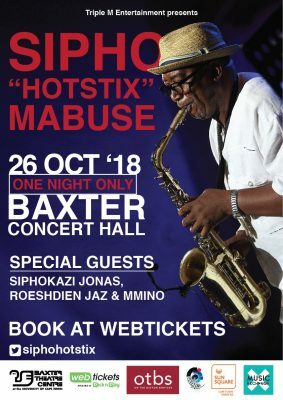 After an absence of more than 30 years Sipho “Hotstix” Mabuse and his band will be returning to The Baxter at 8pm on 26 October for a one-night-only celebration. Not only will Sipho be performing all of his seminal hits, his bigger commitment is to usher in the next generation of hitmakers – all one on stage, all for one night only. As one of South Africa’s stateliest musical treasures who loves his country as much as he does performing live, Sipho promises Cape Town a show well worth the wait. The Sipho songbook has shaped the South African popular music songbook over the past 50 years. Those lucky enough to have secured a ticket to this show will get to enjoy it all, played out in rare live performance. With an impressive catalogue that’s anchored in Africa, all who meet, greet and share stages with Sipho are all touched by a humility and grace that’s as rare as the talent this living legend shares with us all.